Earlier this month Alf sent me a picture of a pair of Post and Go flowers Faststamps, printed in sequence but with a blank stamp between them. They are numbered 01 and 02 (click on the images to see larger versions). I had a similar situation from one of Norwich's NCR machines yesterday with the Winter Greenery, with a collectors' set of 6 spread over 7 - except that the 2nd stamp was missing! As I was buying collectors' sets in both formats (ie with the Holly at the top on some and Butcher's Broom on top on others) this could have had serious implications. Any subsequent sets would have Holly at the top instead of Butcher's Broom, so matching those I had already bought, rather than being in the other order. Fortunately this was the last of a batch, but it's worth remembering if you buy several sets. The assistant told me that he thought that if a stamp was missing the machine could recognise the fact and skip the printing down to the next stamp. 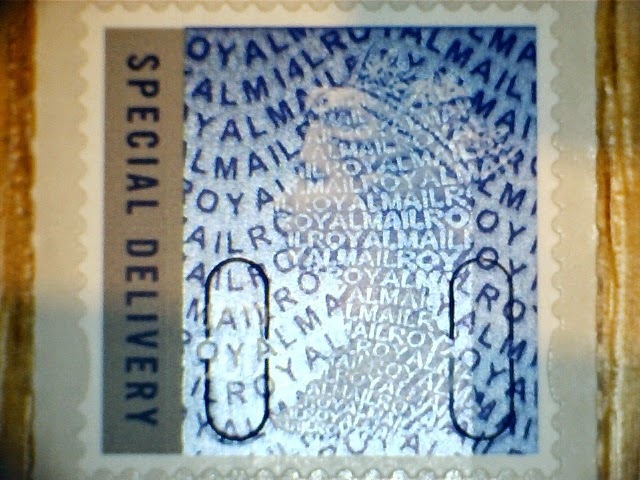 I can think of a way in which this could be achieved but will ask Royal Mail before committing myself! A more comprehensive report about Winter Greenery is in the next post. 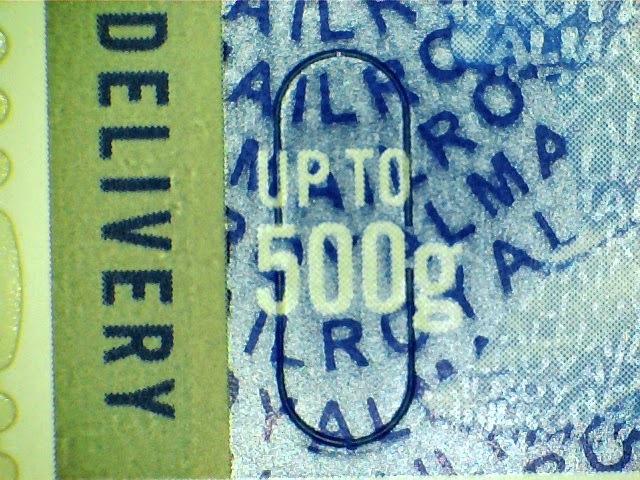 It really is no surprise that following the appearance of the reprinted 100g Special Delivery stamp, the 500g has now appeared, with a printing date of 16/09/14. This is numbered 2986.4 in the Norvic Catalogue and is now available in our webshop. A limited number of cylinder and date blocks will be available. Royal Mail have announced a special slogan postmark to mark the landing of the Philae lander on comet 67P/Churyumov–Gerasimenko following the Rosetta orbiter’s 10 year mission across the Solar System. The postmark will appear on letters delivered Friday and Saturday 14/15 November 2014, which implies that it was only used on 13th, but see below! 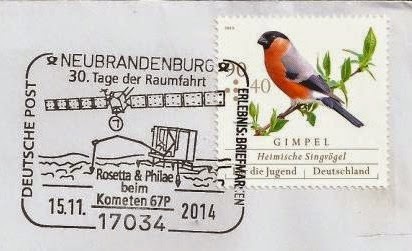 The postmark has continued in use after the weekend. Swindon, South East Anglia, North & West Yorkshire, SE Wales and Exeter Mail Centres. This Swindon 17 November copy from a square envelope. UPDATE 30.8.18. A very late addition to this post as AM has sent this crop from a cover he produced which shows the Welsh 'Delivered By' from SE Wales on 14.11.14. As well as the 1st class stamp he has used the Joddrell Bank stamp from 1966 (no longer valid of course) and Machin definitives adding up to 67p in honour of Comet 67/P. Novelties like this don't have much value to the world at large (unless one of the big cover producers makes them and charges a tenner!) but they add individuality to a collection. Well done! I wonder if there are any of these postmarks on actual space stamps? I found one on the Stampboards forum - so I've now added that. Thanks for the reminder.